25006QD – brilliantly built with top quality industrial parts, this machine is suitable for usage in toughest cleaning environments. 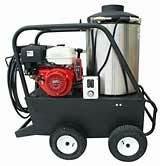 This model offers the cleaning power of a hot water pressure washer as a fully self-contained mobile cleaning system. It produces the total of 7,500 cleaning units and can heat up water to up to 140°F. 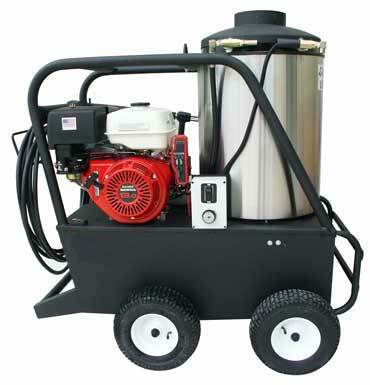 This pressure washer comes with a totally enclosed engine that protects it from rust and corrosion. Use it to clean oil and grease from concrete, construction, food factories, airports, etc. It comes with thermal relief valve that safeguards the pump from overheating. Some other features include triplex plunger pump with ceramic plungers and stainless steel valves, 35’ power cord with ground fault interrupter, trigger gun, adjustable pressure, 13” pneumatic tires with tube and chemical injection.